Tres Leches is one of those cakes I hope to see when they bring me the dessert menu. When it's good, it's sooo good. In that respect, it reminds me of creme brulee: too often it is an eggy custard, but when it is perfect, it is one of the best, most exquisite desserts around. 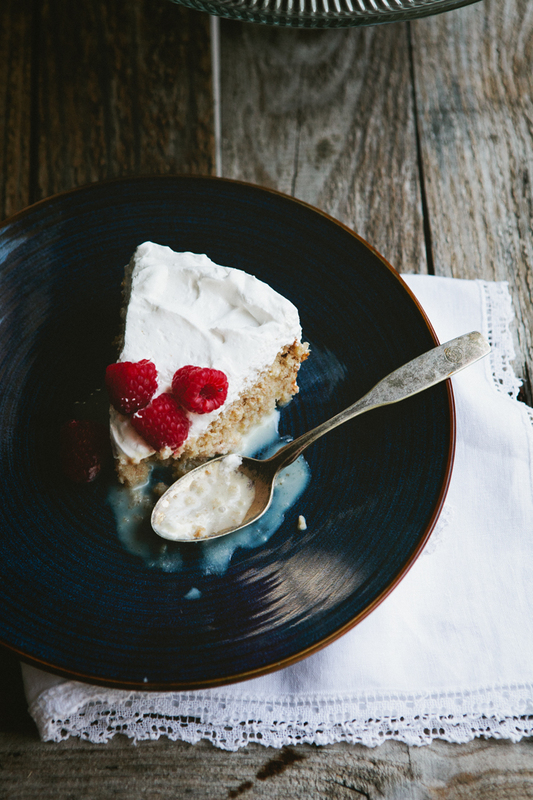 With tres leches, it can be too sweet, too boring, too... rough? But if you're lucky, the cake will be creamy, milky, mildly sweet and with a naughty hint of rum. I've found a lovely recipe in Bon Appetit a few years ago and after tweaking it this way and that I got the cake that works well for me. I like that fact that it is covered in meringue rather than whipped cream - really, who doesn't like meringue? Oh, yes, I should mention some other classic American cake I've written about in this blog: carrot cake, cheesecake, upside down plum cake (now, that one was very popular with the readers! ), and black bottom pie. Yes, yes, pastel de tres leches has not been invented in the US - but I think it is now fully American :). Preheat oven to 350F (180C). Grease or spray 10-in (25 cm) pan at least 2 in (5 cm) deep. Sift flour with baking powder and salt. In a separate bowl, whip egg whites until frothy. Gradually add sugar, whip to stiff peaks. Add egg yolks one at a time, then, alternating, add flour mixture and milk, 1/3 at a time, taking care not to deflate the batter. Bake about 40 min, until the top of the cake is springy and the sides start separating from the pan. Cool completely on rack. Make milk and rum syrup: mix all ingredients. In a small pan, bring to boil sugar and water. Once the syrup starts boiling, start whipping egg whites. When the syrup reaches "soft ball" stage (235F, 113C), with the mixer running, slowly pour it into the egg whites. Continue whipping until cool (ab 5 min). The meringue should be smooth and glossy. 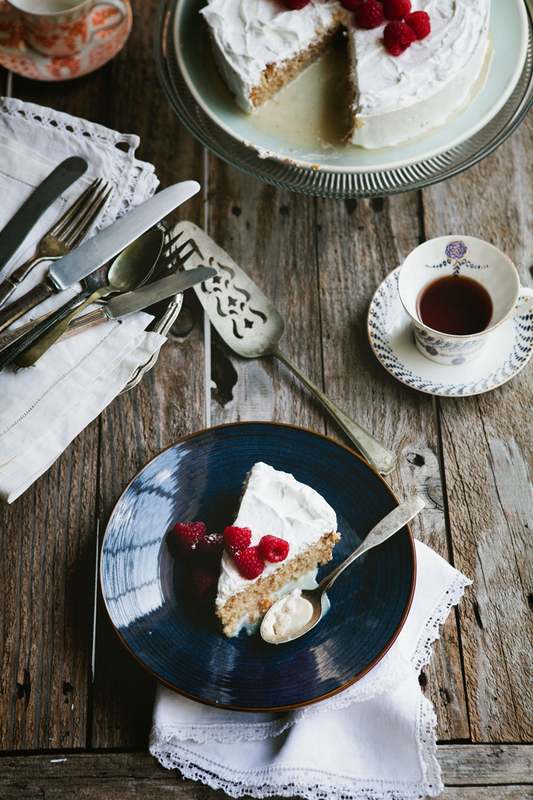 Place cake on a plate with slightly raised sides (to catch any syrup that may seep from the cake). Trim the brown top off. Slowly pour the milk syrup on the cake until all is absorbed. Cover top and sides with meringue. 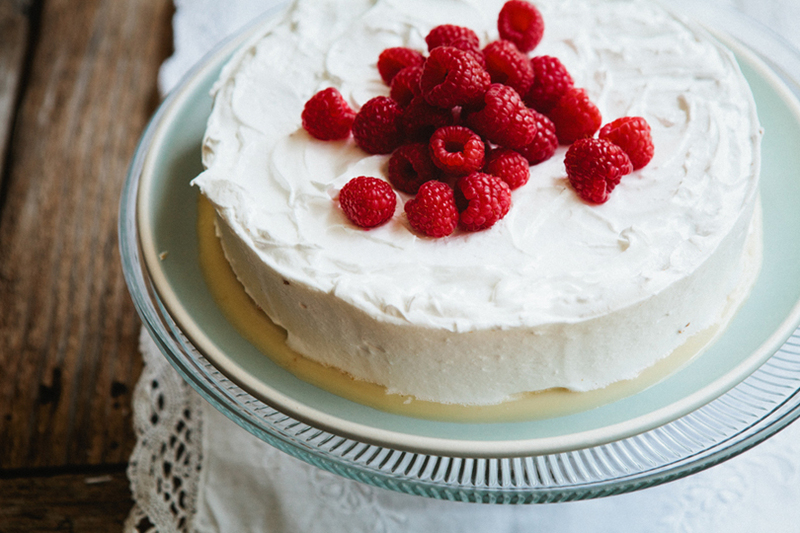 Serve with raspberries if desired. mmm looks really good .So its one can evaporated milk and one can the sweetened condensed milk(the thicker stuff)? Thanks Mary. Nice to meet you :). You've done it again lady. Wow. I made Tres Leches cake for my mom's 60th birthday and it was a hit. Not as gorgeous as yours, but I remember it being darn tasty. Time to make again! Don't you just love it? Satisfied MY sweet tooth for sure. Browsed all your pictures. Great website.love it. This looks SO amazing. I'm definitely going to have to try it! Gorgeous! Except that I am indeed the person who does not like meringue. 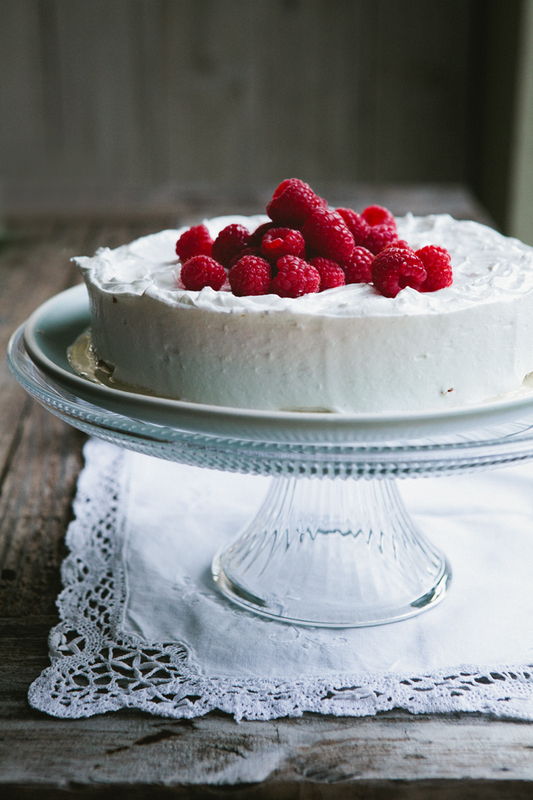 Do you have any suggestions for using whipped cream instead? Oy! No meringue? You can whip 1.5 cups heavy cream with 3 tablespoons sugar and 1 teaspoon vanilla extract. I don't think the cake will keep as long though. 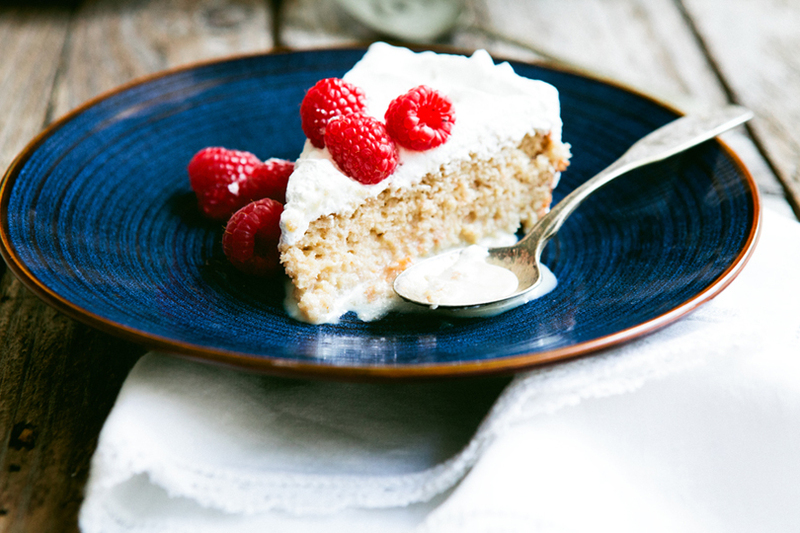 Mmm, tres leches is one of my favorite cakes! I've never seen it made with meringue before... 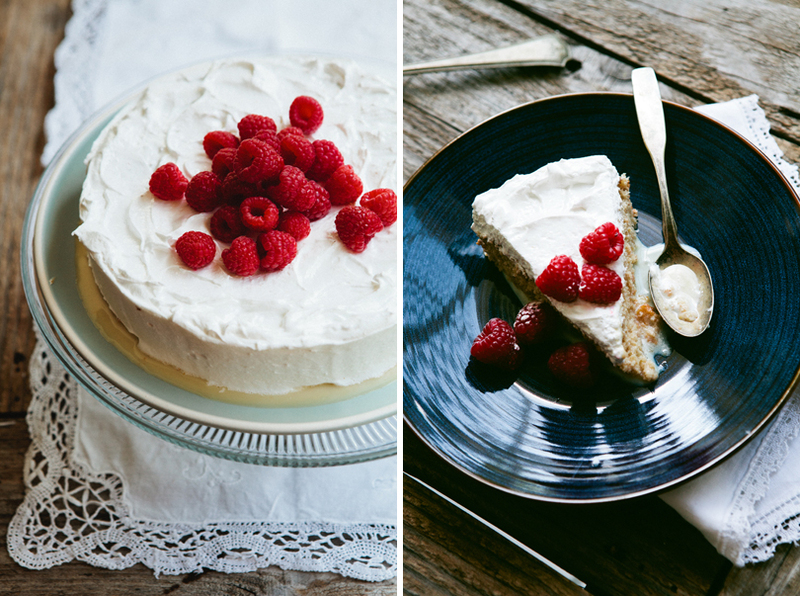 I must admit I'm so fond of the whipped cream on top, but maybe I'll have to try this version some time! It should work with whipped cream, too. Will make it even milkier :)). Oh dear me - this is stunning. Love the addition of meringue! Ваши фотки замечательны. У Вас есть рецепты на русском? great ! i love tres leches, its very popular in Albania too. great blog with cool pics btw. i've just emailed my sister, boyfriend and parents this link, stating that THIS is what i want for my birthday cake. wow. Great website, amazing pictures! I love it! I've been so excited to make this since we featured it on NoshOn.It :) Cake's in the oven now! Aaaand? Tell me, tell me!